The Lake in the Hills Rotary Club held it's first Rockin' Rotary Ribfest July 7 - 9, 2006. The idea was to hold it annually on the first full weekend following 4th of July. Since that time, over $500,000 has been raised and donated back into the community, surrounding area, along with international efforts. 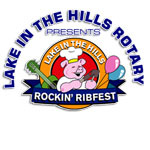 To learn more about this year's upcoming Lake in the Hills Rockin' Rotary Ribfest, be sure to CHECK OUT THE ROCKIN' RIBFEST WEBSITE! Sponsors & Supporters . . .
We couldn't have done it without the volunteers and area businesses who have provided their support! Who We Have Helped . . . Since our Rockin' Ribfest began, the following organizations and "causes" are just a few of the recipients from the proceeds of the Rockin' Ribfest!